Spondylolisthesis is a disease of mankind, in which the original description was of lytic spondylolisthesis and, later, degenerative spondylolisthesis was described. It is classified based on etiology into five types: congenital or dysplastic, isthmic, degenerative, traumatic and pathologic (Wiltse, 1976) , In 1854, Killian coined the term spondylolisthesis to describe the gradual slippage of the L5 vertebra due to gravity and posture. The incidence of isthmic type of spondylolisthesis is believed to be approximately 5% based on autopsy studies. Degenerative spondylolisthesis is observed more frequently as the population ages, and occurs most frequently at the L4-L5 level. Up to 5.8% of men and 9.1% of women are believed to have this type of listhesis. The etiology of spondylolisthesis is multifactorial. ,5], Spondylolisthesis can be graded based on the amount of vertebral subluxation in the sagittal plane, as adapted from Meyerding(1932):  grade 1 - <25% of vertebral diameter; grade 2 - 25-50%; grade 3 - 50-75%; grade 4 - 75-100%; spondyloptosis - >100%. PLIF is a procedure that has enjoyed popularity over the past 50 years. Ralph Cloward pioneered it in 1940. Recent advances in spinal instrumentation and minimal access techniques have revitalized the interest in PLIF. 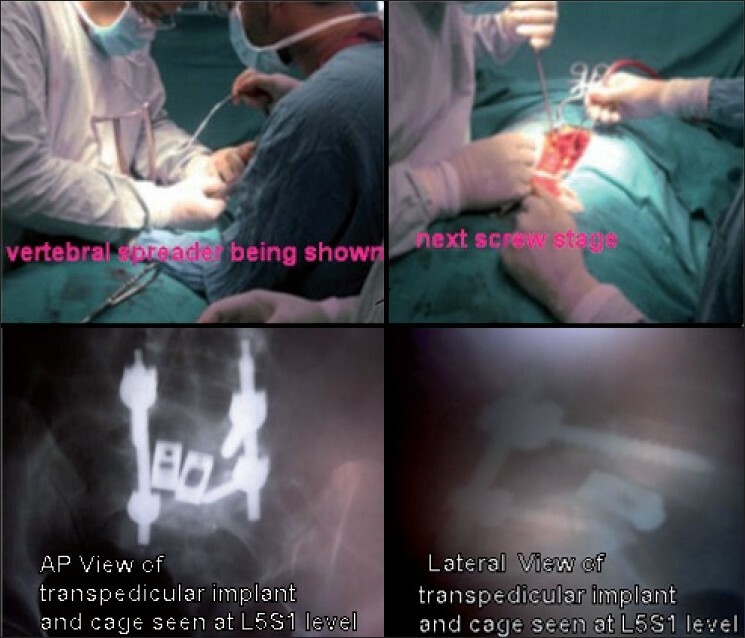 The indications of PLIF and variants of it, such as Transforaminal lumbar interbody fusion (TLIF), have expanded and include numerous pathologies. A surgical technique of PLIF with the use of autogenously posterior elements cut into 2-4 mm as graft material has distinct advantages. James Walter and Simmons et al. studied about 113 patients treated between 1974 and 1980 and noted good objective results as high as 79%. Chip PLIF appears to decrease the morbidity associated with taking autogenous bone from the other sites. They preferred using corticocancellous chips that would allow far more bone to be put into the intervertebral disc space and provide less dead space for the fibrous tissue. Anie, Mannion et al. studied the importance of neurogenic claudication in the diagnosis of spondylolisthesis and, as such, assessed the pain in these patients. The importance of pain was highlighted in the 1990s, when the American Pain Society declared it as the fifth vital sign of medical examination. Interbody fusion being near the center of axis of rotation close to the weight being bearing column has fusion rates of 97% in many series. In the present study, all patients were asked about their history and subjected to thorough clinical examination. The preoperative VAS and ODI scores were noted down. The preoperative dynamic X-rays were taken [Figure 1]a and the disc heights [Figure 1]b, Meyerding grade [Figure 1]b and slip angles were measured. Patients' written and informed consent was taken. All the investigations relevant from the point of view of anesthesia were performed and the preanesthetic clearance was taken. After proper written consent, patients were then taken for the said surgical procedure. After satisfactory induction of anesthesia, the patient was positioned prone on a four-poster frame and all pressure points were well padded. A standard midline posterior approach was used to expose the spine as per the level of involvement. Laminectomy and decompression were performed. The spinous processes and the laminae were made into chip grafts. Graft chips were put into cages in 13 patients. Total discectomy was performed at the degenerated level. 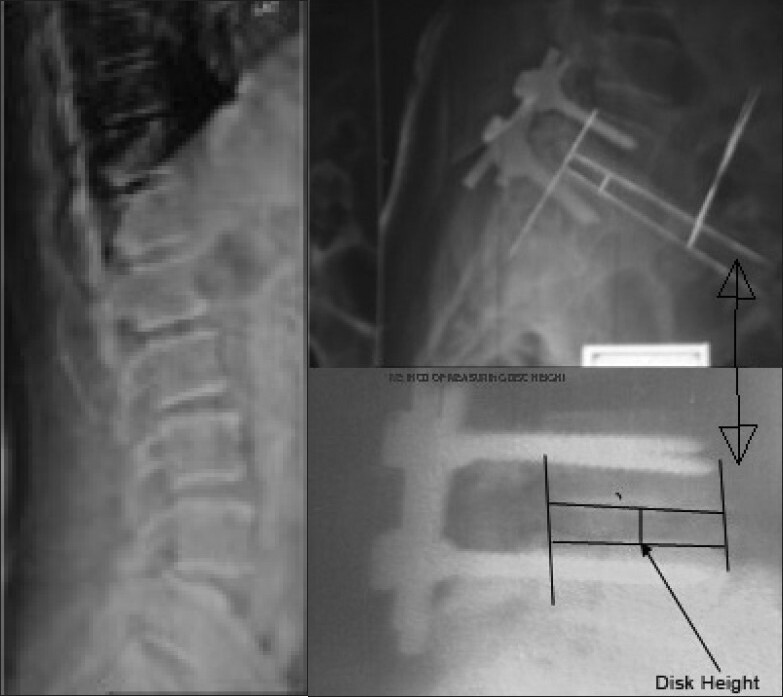 The level involved was fixed using transpedicular monoaxial/polyaxial screws, with reduction screws put into the listhesed vertebra [Figure 2]. After completion of the discectomy and the transfixation, the reduction maneuver , was performed by lifting the upper body in a cranial and posterior direction. The screws were connected with rods and the disc space was gradually distracted to achieve lordosis, along with good reduction. Cancellous bone chip grafts were used as interbody graft and well packed snugly into the level for an interbody fusion in group II while cages were put into group I patients with graft chips inside them. These prefilled cages were mounted on cage holders, with the vertebral space kept in a distraction mode, with mild retraction of thecal sace and were put inside the space. The final construct was tightened in compression. We did not perform any spinal sensory evoked potential (SSEP) during the procedure. Hemostasis was achieved and the wound was closed in layers over a suction drain. The patient was subjected to X-ray L/S spine AP and lateral views on the first postoperative day and the various measurements were taken again for comparison. Patients were mobilized on the third postop day with use of walker and lumbosacral orthosis (LSO). After surgery, the patients were braced in an LSO for a period of 3 months for comfort. Patients were discharged on the third postoperative day and were advised to report to the outpatient department on the 10th day for removal of stitches and, subsequently, every month for about 24 months. Fusion was assessed by lumbosacral X-rays [Figure 3]. Figure 3: (a) Fusion seen on X-ray in the cage group, (b) fusion seen on X-ray in the graft group. The total operative time averaged 3.2 h (range, 2-5 h). The estimated blood loss was 200 ml (range, 100-350 ml). Among the 28 patients, 71.5% (n = 19) were females and 28.5% (n = 9) were males. 71.5% (n = 18) had L4/L5 and 28.5% (n = 10) had L5/S1 spondylolisthesis. 42.9% (n = 11) were of grade I and 57.1% (n = 17) were of grade II spondylolisthesis. We used spinous process chip grafts in 15 patients and cage in 13 patients. This is comparable with work done by Walter Js  in which although the number of patients was more, the spinous processes were used as chip grafts and fusion was assessed. 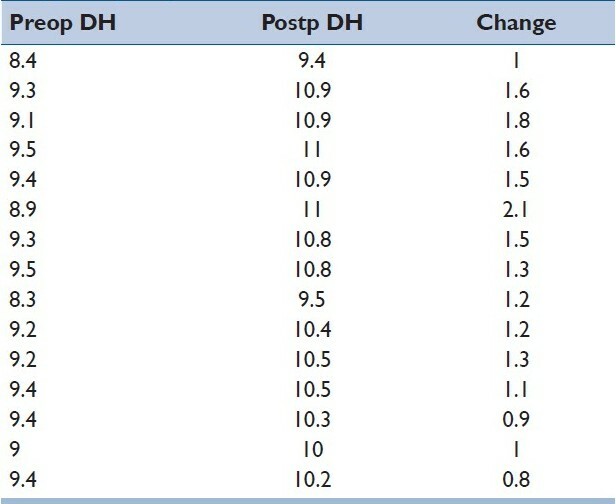 We observed a mean change in disc height of 1.2 mm ± SD in the graft group and 2 mm ± SD in the cage group of patients. This is comparable with the research project of P. Gopinathan et al.,  in which the mean change in disc height was 4 mm. 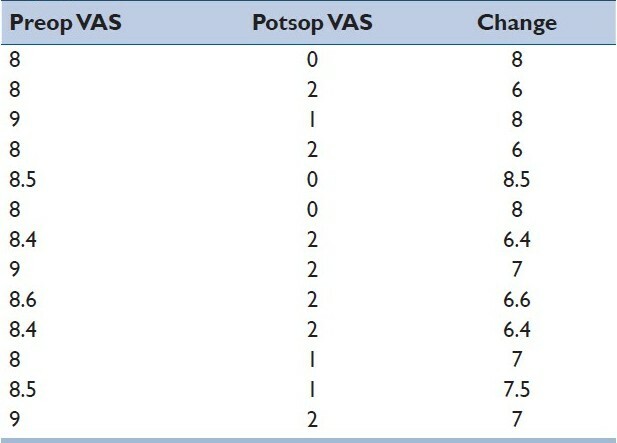 The mean change in VAS score in the graft group was 5 (62%) and that in the cage group was 7.2 (88%). This is comparable with the research work of P. Gopinathan et al.,  in which two points better VAS score improvement than ours was seen. In both the groups, the mean improvement in slip angles was about 3.2° ± SD. In this series, we noted complications in about four patients, with implant loosening in one (3.5%) of the patients, pedicle wall breakage in one (3.5%) and wound infection (MRSA-methicillin resistant Staph Aureaus) in one (3.5%) patient. One patient with implant loosening and another with pedicle wall breakage was reoperated. One patient with implant loosening had mild backache on movement with improvement in VAS from 9 to 4. She is waiting for the implant removal. One patient with wound infection was managed with superficial wound debridement and her cultures showed MRSA positivity, for which she was treated. It is a well known fact that weight transmission is the sole culprit for the progression of spondylolisthesis. 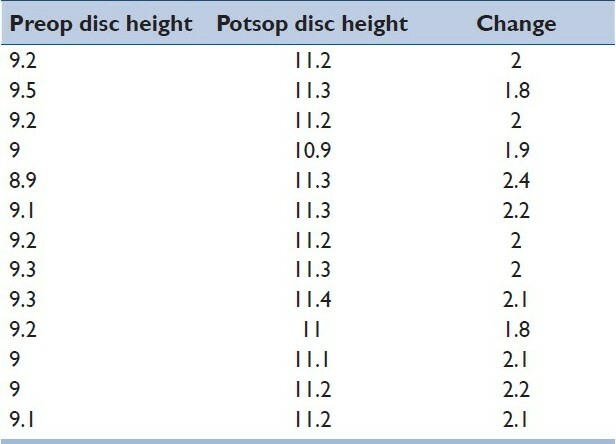 Disc space height maintenance indicates total discectomy. As a result, it increases the neural foramina height and, thus, larger the height, stronger graft (volume) can be inserted. In our study, we operated 28 patients in the age group of 30-70 years, of which six patients (21.42%) were in the age group of 30-40 years, 10 (35.71%) of 40-50 years, nine (32.14%) of 50-60 years and three (10.71%) were in the age group of 60-70 years. Among the 28 cases, 19 (67.85%) were females and nine (32.14%) were males. In this series, 18 (64.28%) had involvement of the L4-L5 level while 10 (35.71%) had involvement of the L5-S1 level. About 11 (39.28%) had grade I while 17 patients (60.71%) had grade II spondylolisthesis. Of the total 28 patients included in this study, all presented with LBA while 18 (64.28%) had neurogenic claudication as the presenting symptom and 10 (35.71%) patients had additional radiculopathy. Associated symptoms appeared at approx. 1 km distance in nine (32.14%), 2 km distance in seven (25%) and 3 km distance in 12 (42.85%) patients. Some advocate radical excision of the intervertebral disc to help with the reduction , as well as placement of an interbody graft. Various methods  used in the literature purpose include bone dowels, rectangular or threaded bone plugs, local bone chips or bone or metallic cages. In our series, we used snugly packed local bone chips obtained from the spinous processes and the laminae in 15 patients, and cages in 13 patients. We noted a mean increment in disc height of about 1.2 mm in 15 patients within the graft group while a mean increment of 2 mm was seen in 13 patients of the cage group. In our series, a mean increase in the VAS score of 5 ± SD was observed in the graft group while a mean increase of 7.2 ± SD in VAS score was observed in the Cage group of patients. This shows that closer the disc height restoration to normal during surgery and maintaining it well in the postop period had better improvement in the VAS scores. In both groups, 85% reduction, 3.2°decrease in slip angle and 86% fusion was achieved. It was observed in this series that the values remained higher in the cage group, with about 2.2 points higher VAS score and 0.8 mm higher increment in disc height. This is a statistically significant difference (P = 0.012 and 0.217) between the two groups, obtained using SPSS (Wiskonson) software. The probable reason for better restoration of disc space height in the cage group is obvious. The structured graft resists the final compression better than the nonstructured graft. Although we achieved good distraction before final compression in all patients, the only-graft groups lose some height compared with the cage group with the final maneuver. In our series, we performed decompression in all the patients in both the cage and the graft groups. During 1942-50, Ralph Cloward , in his series of 165 patients operated by this technique showed fusion rates of 93% and clinical results of satisfaction in 97%. This is comparable to our series, with fusion rates of 86% and satisfying clinical results in 87% of the cases. Neil, Naohisa Miyakoshi et al. showed in his series that intervertebral disc was an important cause of spondylolisthesis, which is also the case in our series of 28 patients. In our patients, as per Kirkladdy Willis, the intervertebral discs were in various stages of dysfunction and instability. James Walter Simmonsn MD and Mureiy Y Imagama et al., noted the utility of local chip grafts in the fusion, and noted a fusion rate of about 100%. Anie, Mannion et al. has stressed the importance of pain in the assessment of spondylolisthesis patients. 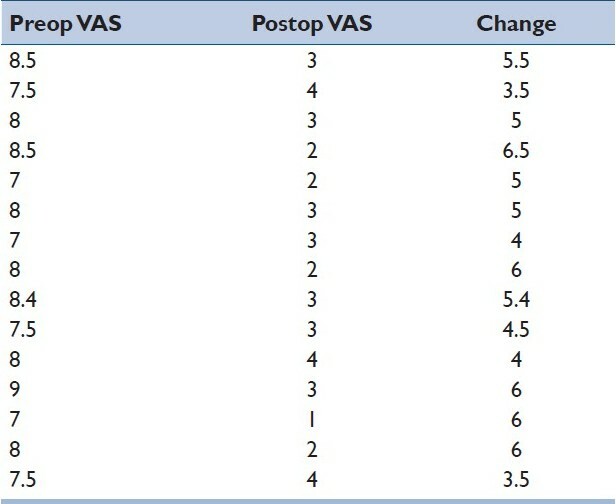 They have compared the pre- and postop VAS scores in their patients, with mean improvement of 5 ± SD points, which is comparable to our series, with improvement of 6.1 ± SD (mean of both groups). For solid bone union, some investigators recommended PLF + PLIF. In our series of 28 patients subjected to the Posterior Lumbar Interbody fusion (PLIF) procedure, it is concluded that maintenance of disc height with the help of spacer is preferred over graft. Using spinous processes avoids additional incision and graft-site morbidity. Although a technically demanding procedure, the PLIF procedure is a procedure of choice for the grade I, II and III degenerative and isthmic spondylolisthesis. 2. Wiltse LL, Newman PH, Macnab I. Classification of spondylolisis and spondylolisthesis. Clin Orthop Relat Res 1976;117:23-9. 3. Kang SH, King YB. Differences in outcome among various fusion methods of lumbar spine. J Korean Neurosurg Soc 2005;37;39-43. 4. Gregory JB,Amundsen G. Posterior Lumbar Interbody Fusion:Techniques of Spine Surgery. 8th ed. Benzell; 2010. p. 1312-22. 5. Newman H, Stone KH. Aetiology of spondylolisthesis. J Bone Joint Surg Br 1963;45;39. 6. Hu SS,Tribus CB, Diab M, Ghanayem AJ. Spondylolisthesis and spondylolysis. J Bone Joint Surg Am 2008;90:656-71. 9. Dewald RL, Faut MM, Taddonio RF, Neuwirth MG. Severe lumbosacral spondylolisthesis in adolescents and children: Reduction and staged circumferential fusion. J Bone Joint Surg Am 1981;63:619-26. 10. Sisbrandij S. Reduction and stabilisation of severe spondylolisthesis.A report of three cases. J Bone Joint Surg Br 1983;65;40-2. 11. Gopinathan P, Hussain A. Jacking of the spine, a better way of treating lumbar spine instability, J Orthopedics 2005;2:e3. 12. Cloward RB. Posterior lumbar interbody fusion updated. Clin Orthop Relat Res 1985;193:16-9. 13. Cloward RB. Spondylolisthesis: Treatment by laminectomy and posterior interbody fusion. Clin Orthop Relat Res 1981;154:74-82. 14. Miyakoshi N, Abe E, Shimada Y, Okuyama K, Suzuki T, Sato K. Outcome of one-level posterior lumbar interbody fusion for spondylolisthesis and postoperative intervertebral disc degeneration adjacent to the fusion.Spine (Phila Pa 1976) 2000;25:1837-42.